VANCOUVER, March 28, 2019 /CNW/ - NexGen Energy Ltd. ("NexGen" or the "Company") (TSX: NXE, NYSE MKT: NXE) is pleased to report radioactivity results for the first twenty holes comprising 8,216.5 m from the Company's first phase of Feasibility-stage drilling program at our 100% owned, Rook I property in the Athabasca Basin Saskatchewan. Leigh Curyer, Chief Executive Officer, commented: "This development focused drilling continually highlights the incredible nature and strength of Arrow in terms of the continuity of high grade uranium. Intersecting the type of mineralization reported in today's release with such regularity is simply unique and continually increases the technical strength of Arrow. We look forward to delivering the results of the 10 rig program throughout 2019." 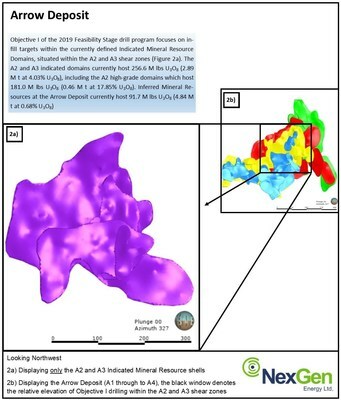 Troy Boisjoli, Vice-President, Operations and Project Development, commented: "These results demonstrate the confidence in the continuation of high-grade uranium mineralization within the A2 Sub-Zone. This initial release is just the beginning of what will surely be another highly successful 2019 program as the Company moves towards completing the Feasibility Study which will incorporate an updated mineral resource estimate based on the 2019 drill campaign which is the largest in the Company's history." Forward-looking information and statements also involve known and unknown risks and uncertainties and other factors, which may cause actual results, performances and achievements of NexGen to differ materially from any projections of results, performances and achievements of NexGen expressed or implied by such forward-looking information or statements, including, among others, negative operating cash flow and dependence on third party financing, uncertainty of the availability of additional financing, the risk that pending assay results will not confirm previously announced preliminary results, imprecision of mineral resource estimates, the appeal of alternate sources of energy and sustained low uranium prices, aboriginal title and consultation issues, exploration risks, reliance upon key management and other personnel, deficiencies in the Company's title to its properties, uninsurable risks, failure to manage conflicts of interest, failure to obtain or maintain required permits and licenses, changes in laws, regulations and policy, competition for resources and financing, and other factors discussed or referred to in the Company's Annual Information Form dated March 4, 2019 under "Risk Factors". 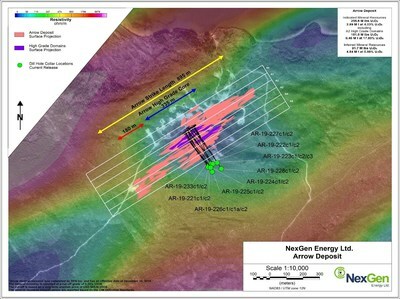 September 7, 2016 NexGen Affiliate IsoEnergy Ltd. Enters into Amalgamation Agreement with AireSurf Networks Holdings Inc.
April 30, 2014 NexGen identifies additional geophysical anomaly targets at Arrow Discovery Zone. April 23, 2013 NexGen begins trading on the TSX-V Exchange under the symbol "NXE"